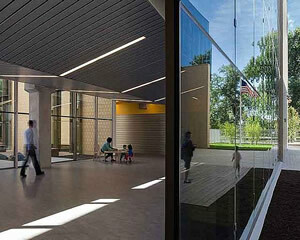 FGM Architects; Valerio Dewalt Train Associates, Inc.
Space per pupil: 217 sq.ft. Founded by John Dewey in 1886, the University of Chicago Laboratory Schools (Lab) have been a successful experiment in teaching theory and practice, educating students using Dewey’s theories from nursery-aged through 12th grade. Earl Shapiro Hall, focused on early childhood education, is the first phase of a program at Lab that includes the top to bottom renovation of the seven existing buildings that make up the campus. A new arts/media wing, now in progress, will complete the program. 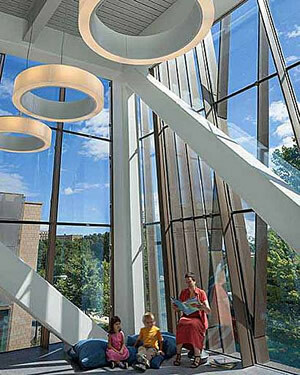 The Lab Schools engaged Valerio Dewalt Train Associates as Design Architect and FGM Architects as the Architect of Record for the expansion of this highly respected institution. Opened in the fall of 2013, the 130,000 sf Earl Shapiro Hall (ESH) is located on Stony Island Avenue across from Chicago’s Jackson Park and the landmark Museum of Science and Industry. The building program consists of 34 classrooms and two un-programmed learning labs, for students three years old through second grade are on two levels. FGM Architects, a specialist in school programming and planning throughout the state of Illinois, and VDTA focused their attentions to applying the theories of John Dewey to design outstanding learning spaces for Lab. The building’s planning is based on the incorporation of outdoor spaces, learning labs and other in-between spaces as breakout, work and collaborative learning areas adjacent to the classrooms. Every space is designed to promote the spark of learning. The classrooms are designed to be flexible and to encourage the teaching philosophies of the Reggio Emilia approach to early childhood education. The Reggio Emilia philosophy grew from the school’s original principles of placing the child within a larger learning community, guiding them in learning, allowing them to interact with curriculum and ensuring that play is accessible in every part of the building. Among the building’s innovations is the incorporation of un-programmed learning labs at the center of the school. These allow larger groups to come together and give teachers more diverse options to use as engaging learning environments. 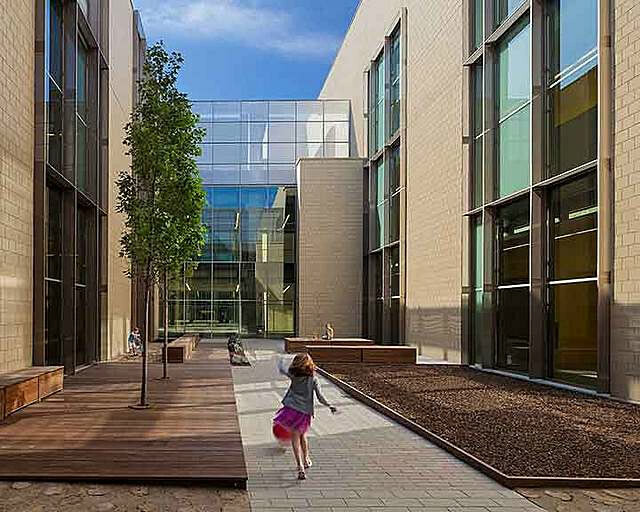 Outdoor play spaces, the gym, art and music rooms and the dramatically cantilevering library are important destinations for students outside the classroom. Play is important to learning and is incorporated into each child’s day. 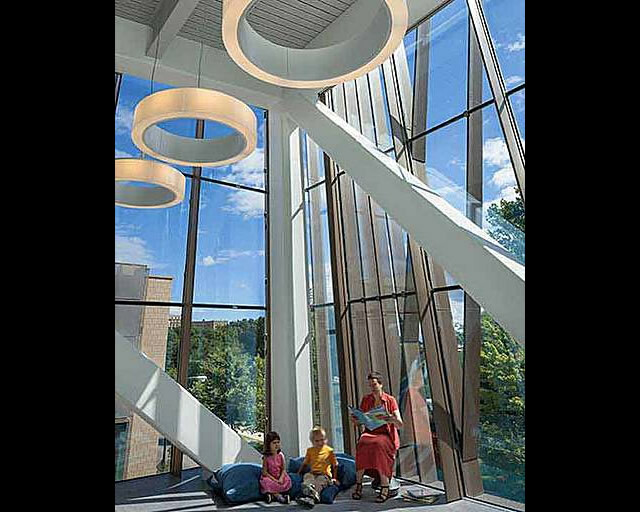 The cantilevered library serves as a focal point of the design, emphasizing the importance of books and reading in the school’s philosophies of education. Valerio Dewalt Train’s significant design portfolio was critical in making them the design partner on the project. Using the visioning process as a guide, VDTA provided design solutions that incorporated these critical findings. The cantilevered library, large gathering spaces and incorporation of outdoor space are just a few special features of the design. The building itself was also designed as a teaching tool, using exposed materials and exposed mechanical systems to spark the curiosity of how buildings function and are constructed. The Fibonacci series is used as a proportioning and rhythmic device in the design of the exterior facades and is literally incorporated into wall coverings in public spaces. 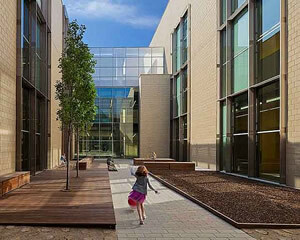 Public spaces promote the gathering of children including the use the lobby for the tradition of the “lobby sing” or the arrangement of classrooms around interior and exterior (courtyard) learning laboratories. The large group spaces are also used for special events with parents or with other Lab students. Socialization and collaboration is as much a part of the educational process as the core curriculum. Materials and furniture were selected with adaptability and ease of use in mind. In favor of children moving seamlessly from one learning activity to the next, the design focuses on furniture and other materials that were simple for children to use, helpful to students to engage in their environment and easy for teachers to arrange and move. From large group learning to individual learning, the materials are able to adapt from activity to activity. This project employed an extensive research program to initiate the project, beginning with the design team’s immersion in the daily activity in the life of the school. Stakeholders, including teachers, parents, administration and members of the extended community, were interviewed regarding both the current culture of learning and community at the school and visions for education in 10 or 20 years in the future. These questions organically led the team to extend the conversation identifying key questions that were asked of thought leaders in education in a series of interviews. The design team’s research findings were brought back to a stakeholder group in an extended workshop with the design team to evaluate the findings and set a vision for the future of the Lab School. The process was documented in a publication, “The Future of Education”, which was widely circulated. The architectural team, immersed in the culture and world of Lab, was then prepared to plan and design this facility with the input of the community. Originally planned for a vacant site on the Lab Schools’ existing campus, the ESH was moved off-campus when a superior site across from Chicago’s Jackson Park and the Museum of Science & Industry (MSI) became available. The first advantage is the ability to provide significant outdoor space, which was identified as a critical feature for the young students’ education. The natural beauty of the park is especially visible to students, as the design features numerous views to the park. Visual access to the outdoors and changing landscape of the park enriches the students’ learning environment and engages their imaginations. The location also offers proximity to the lakefront, the park, and a major cultural institution. Earl Shapiro Hall represents the first physical dialogue between the University of Chicago and the MSI. The second advantage is a more pragmatic one. Traffic at drop- off and pick-up times has always been a major problem at the Lab Schools and the expanded ESH stood to make the problem worse. By moving to a new site where traffic can be managed, a potentially hazardous inconvenience has been mitigated. Though the idea of removing the ESH from the current campus was not initially supported by all, the site on which the building was constructed won over the entire community. 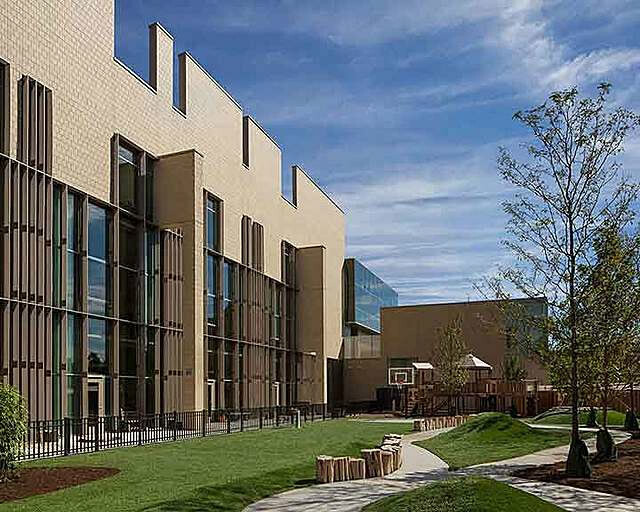 The University of Chicago Laboratory Schools Earl Shapiro Hall project embraced sustainability as a fundamental element of the design. The Project Team, including members of The Laboratory Schools Green Team, members of The University of Chicago Facilities Services, Design Team Architects and Engineers worked together to establish goals and set priorities for the project. The LEED rating system was utilized by the project team as a benchmark of The Earl Shapiro Hall project; Silver certification was identified as a project goal. 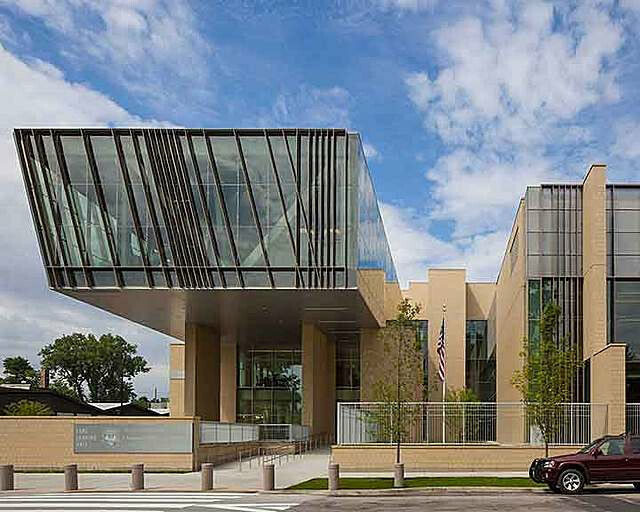 The team looked beyond the LEED checklist to consider how sustainability should influence the design: Factors including first cost, life cycle analysis, environmental impact, and connection to the community each influenced the decision process. The building is designed to integrate the interior and exterior through an abundance of views and natural light. Vertical solar shades on the east end and west façade are arranged according to the Fibonacci sequence. Additional sustainable strategies include the use of healthy building materials, improved indoor acoustical performance and air quality, reduction of water use, and storm water management and integration within the landscape. Earl Shapiro Hall successfully incorporates the theories of John Dewey and the Reggio Emilia philosophies. The school teaches children how to collaborate and promotes the spark of learning. Outdoor spaces, as important as indoor spaces, help incorporate all aspects of nature. Play is accessible indoors and out. The new school helps children find out what they are passionate about; to be engaged in the world around them. The school incorporates differential learning because the way students learn is vast reflecting human variability and the design accommodates differences as well as similarities. Educational Planning: FGM Architects Inc.
Construction/Project Management: Lend Lease, Inc.
Electrical Engineer: Primera Engineers Ltd. Mechanical Engineer: Arup North America, Ltd.
Civil Engineer: Environmental Design Intl., Inc.
Acoustical Consultant: Threshold Acoustics LLC. Food Service/Kitchen Consultant: S2O Consultants, Inc.
Code Consultant: Rolf Jensen & Associates, Inc.
Environmental Consultant: HJKessler Associates, Inc.